The West Somerset Railway is the longest Heritage line in the United Kingdom. Situated close to Taunton the line starts at Bishops Lydeard and finishes in Minehead, meandering through the Quantock Hills, along the Bristol Channel Coast, and pausing at 10 stations along the line. Crowcombe Heathfield station was the location for the Beatles’ ‘A Hard Days Night’, the historic town of Watchet dates back to Saxon times, whilst Washford station is just a short walk from Cleeve Abbey and Torre Cider Farm. Starting at Bishops Lydeard or Minehead and travelling a return journey to Williton. Locomotives begin to steam around 6.30pm, and the band warm up. The train then departs at 7pm and begins its musical journey into the night. 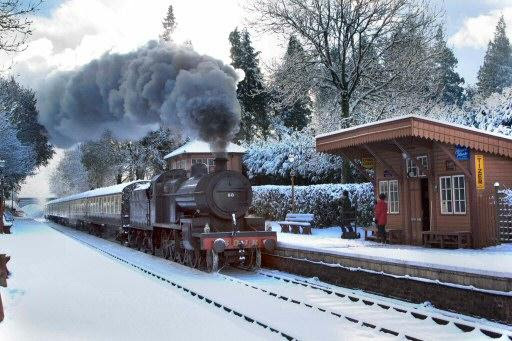 Trains are scheduled to run on Monday 10th and Tuesday 11th December, Saturday 15th and Sunday 16th December. Ticket prices vary according to journey (£10-£15). Passengers are advised to bring a torch as the journey gets ‘wonderfully dark’. ‘Fish and Chips seats’ are available as part of the 5pm service and a separate Quantock Belle Dining train leaves Bishops Lydeard at 5.20pm, serving a menu including Braised beef in red wine with crispy roast potatos; Bread and butter pudding and Pear and ginger crumble. Check website for varying prices, tickets from £10. Quantock Belle dinner train table for two – £140 and table for four – £260.00. Santa will be in residence, 1,000 ft above sea level, at Woody Bay Station, Parracombe, Barnstaple, this December. Families can get into the festive spirit and enjoy an exciting two-mile return journey from Woody Bay Station to Killington Lane and back by steam train. Trains depart at: 11.00, 12.00, 13.00, 14.00, & 15.00. Santa will also be in his grotto (ex 1864 GWR Transfer Shed) at the Yeovil Railway Centre, which was formed in 1994 to preserve the original Southern Railway turntable (installed in the late 1940’s, allowing visitors to watch the spectacle of large steam engines being turned and serviced). After a short train ride behind a steam locomotive, visitors head to Santa’s grotto where their ticket entitles them to free tea, coffee or squash and a mince pie. Model railway layouts will be running, and snow and bubble machines creating a festive setting. Santa Expresses leave Bishops Lydeard on various dates throughout December. The train travels through the Quantock Hills to Williton (and then returns), with Santa visiting children at their seats during the journey. Children receive a small gift, whilst Adults are served a mince pie and a festive drink. The journey takes about an hour and a half. Visit Exmoor has been Highly Commended by the British Guild of Travel Writers for its Eat Exmoor initiative. Devised to promote local food & drink and highlight the link between the diverse Exmoor landscape and its delicious produce, the Eat Exmoor colour guide and online focus (www.Visit-Exmoor.co.uk/EatExmoor), along with the Eat Exmoor Trade Show, organised by the Exmoor National Park Authority, were praised by the BGTW. Porlock Oysters – Harvesting native oysters died out in the 1890s (due to overfishing) but Porlock Bay Oysters, a community-led project, has been reviving the tradition. For a more sustainable supply of restaurant quality oysters all year round Pacific Oysters were introduced and, as the Porlock water quality is excellent, the Food Standards Agency has given Porlock Bay Oysters a grade A food classification rating, making them among the purest available. Quantock Brewery – set up in December 2007, with the philosophy to brew the highest quality ales using the best natural ingredients, the brewery strives to produce quality beers that have flavour and character, with no added sugar or chemicals. In 2015, due to growing national demand, Quantock Brewery stepped up to a larger facility in Bishops Lydeard, Somerset, where it has a brewery shop and taproom open to the public, allowing people to ‘try before they buy’. Miles Tea & Coffee – Based in the foothills of Exmoor National Park, their Porlock Roastery shop is the place to head for. A family run business, established in 1888, Miles are a founding member of the Ethical Tea Partnership and members of the Fairtrade Foundation. Most popular brand include West Country Original tea, Bright and Breezy coffee & Heavenly Hot Chocolate. The Old Stables – Hurling Pot farm, Chelynch, Shepton Mallet, Somerset, BA4 4PY. Having just won Gold at this is the perfect place to stay for a weekend break. Set on the edge of the Mendip Hills, this is a Grade II listed 17th century barn with three en-suite bedrooms (one kingsize, two super kingsize) and Gold winner at the Bristol, Bath and Somerset Tourism Awards 2017/18. All the rooms come furnished with fluffy towels, mini fridges, British made toiletries and bath robes. Pet friendly, it can supply a doggy care pack in rooms if required. Dunkery Beacon Country House, Wootton Courtenay, Dunster, Somerset, TA24 8RH. A luxury country house with eight rooms, (two dog friendly), set within an acre of beautiful gardens. Each room is individually decorated and comes with pocket sprung mattresses, tea and coffee making facilities and flat screen TVs. The property has an award winning restaurant which serves locally sourced produce and there is also a bike storage facility and drying room available for those who are exploring Exmoor. Prices from £80 (based on two people sharing including breakfast). For more information visit www.visit-exmoor.co.uk.